How do you improve on something you think is already perfect? Go back to your beginnings and the basics of what you know. That is what I did with these new calls. These calls have been in development for the past 5 years. Never wanting to settle for complacency and always wanting to improve pushes me to look for something better than the Crystal and slate calls I already have. In my original mission statement was my answer......my Vision....to be the BEST, no matter what. I have changed the cup, the insides, and the treatment to the call while building it, the profiled edge (which makes the call easier to hold, looks good and is more comfortable) and added two new calling surfaces! Wow...what a Vision! 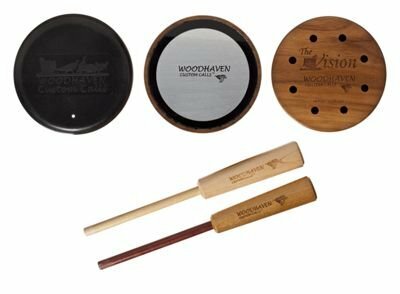 The powder coated, anodized aluminum and the fused crystal offer two more powerhouse options to the WoodHaven Calls line! Tone and realism is unsurpassed with the famous WoodHaven Calls', high front end and kees and those powerful back ends but what we found was a way to add the very best mid ranges in any yelps from any call ever with the Vision. Stroke for stroke, yelp for yelp, simply the best!